And saying, Repent you: for the kingdom of heaven is at hand. “Repent you: for the kingdom of heaven is at hand.” said the Lord Jesus when He came to do His work. There’s a very important message: He hopes us to repent and enter the kingdom of heaven. However, there’s still many people paying no attention to it on hearing this news. So what’s the reason? Maybe they don’t understand the importance of repentance or the meaning of entering the kingdom of heaven. Let’s think about it. God prepared beautiful living environment for us when He created us humans in the beginning. He hopes we humans can be compatible with Him, and live under His blessings and protection. But after mankind was corrupted by Satan, what man did was full of evil and corruption, and against His demands. God wants to save the deeply corrupt mankind, so He did a lot of work, hoping us humans to live in His light. Those who have changed are qualified to enter the kingdom of heaven. Moreover, we should grasp the last change to repent in the last days. Repentance means to turn to God and turn From Evil. 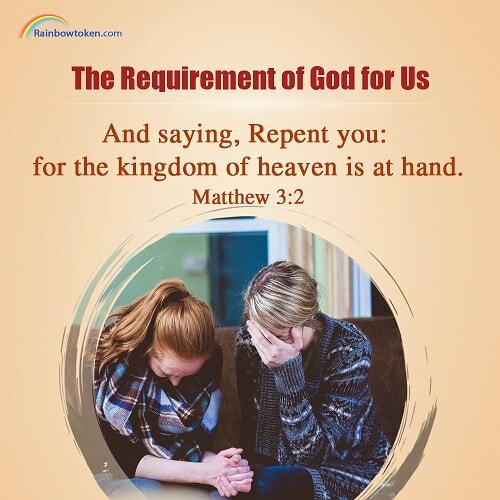 Each of us should know our corruption and truly repent to God and no longer do evil, and then we can be qualified to enter the kingdom of heaven. For God is holy, those who are filthy are incapable of seeing the face of God. God’s words say, “For I cannot bring My enemies and people reeking of evil on the model of Satan into My kingdom, into the next age.” From this we can understand God’s demands. Everyone who yearns for entering the kingdom of heaven should act according to His requirements. Oh God, I’m a filthy and corrupt man, but You’ve still done such great work of salvation to feed and nourish me, so that I can understand Your will, and live the likeness of a real man. I’m grateful to You and praise You. May You do more work on me, judge me and cleanse my corruption. Amen! In the midst of trials, even when you don’t know what God wants to do and what work He wants to accomplish, you should know that God’s intentions for mankind are always good. For whoever finds me finds life, and shall obtain favor of the LORD. Proverbs 8:35 Thoughts on Today’s Verse… We understand that God is the truth, the way, and the life. You have searched for God, of course you find the source of man’s life. God’s words say, “Perhaps, now,..